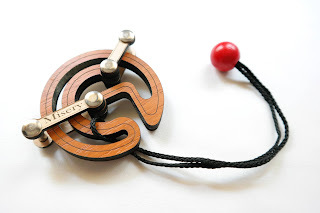 Siebenstein-Spiele is one of my favorite puzzle manufacturers, because their puzzles closely resemble the ones by Jean Claude Constantin, which are made with many types of wood and other quality materials. Both companies produce very original designs and the Misery puzzle by Jürgen Reiche (founder of Siebenstein-Spiele) is quite an interesting puzzle, indeed. With a curious circular shape and two hinges attached at both ends, the Misery puzzle is definitely an intriguing design, where the goal is to free the rope and bead from the frame. 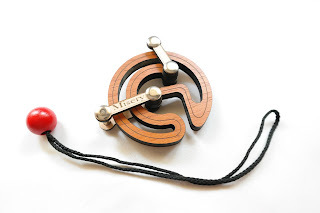 Made from laser-cut wood, the puzzle looks a bit intimidating at first, but you shouldn't fear it, since it's actually easier to solve than you'd think. When you start the rope is attached at one end of the frame. There's a small path inside the circle from where the rope can move through, but for that you need to move the hinges back and forth, because they might be blocking your path. The movement of the hinges is limited, but it's enough to make the rope pass beneath them. One thing you should take into consideration, which is common among string puzzles, is that the rope is quite long and easily entangled. You should plan your moves carefully and strategically to avoid making any unnecessary knots. 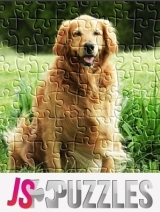 The difficulty of the puzzle varies from your experience with this type of puzzles. I didn't find it very challenging and was able to solve it within 10 minutes, but it can be very challenging for beginners. I believe a correct classification of its difficulty would be a level 7/10. Putting the string back to its original state is straightforward, since you just need to reverse your previous steps and follow the curves of the puzzle from outside to inside. Fortunately, solving the Misery puzzle by Siebenstein-Spiele won't make you miserable. On the contrary, it's challenging enough without being frustrating, and provides a rewarding and satisfying feeling after solving it. Availability: You can find the Misery puzzle at Brilliant Puzzles for just $15.95 USD. There's also a wide variety of Siebenstein-Spiele puzzles on offer there.